DemoCurmudgeon: The Voting Privilege separates have and have-nots! The Voting Privilege separates have and have-nots! If I didn't think there were more important economic and health care issues to deal with, I would be out there making access to voting much harder for rural conservatives. Wasn't it Trump Party conservatives hero Brett Kavanaugh who said, "what goes around comes around"? Wouldn't it be fun to consolidate rural places to vote, institute shorter hours...you know, save money and lower taxes, right? Voting rights cannot be denied or abridged based on the following: "Race, color, or previous condition of servitude" (15th Amendment, 1870) … 1913: Direct election of Senators, established by the Seventeenth Amendment gave voters rather than state legislatures the right to elect senators. 1920: Women are guaranteed the right to vote by the Nineteenth Amendment to the United States Constitution. 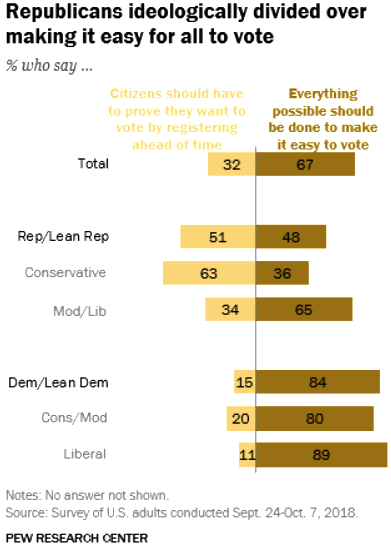 Conservative Republicans stand out for their opposition to allowing people to register vote at the polls on Election Day and automatically registering all citizens to vote. Fewer than half of conservative Republicans support these steps (35% for Election Day registration, 45% for automatic registration) ... Conservative Republicans are also the only partisan-ideological group in which a majority (60%) favors removing people from registration lists if they have not voted recently or confirmed their registration. The measure proposed by Rep. Duey Stroebel, R-Saukville, would prohibit clerks from opening early, late or on weekends to accommodate voters wishing to cast their ballots before Election Day … the bill aims to give residents of smaller communities the same access to absentee voting as those in larger communities that can afford to hold extended balloting ... people in rural areas don't have the opportunity to vote on weekends or evenings. The proposal could be even more vexing for clerks in small towns, who often work part-time and at the convenience of local residents, said Richard Stadelman, executive director of the Wisconsin Towns Association … it's not unusual for small-town clerks to open their offices on nights and weekends to accommodate in-person absentee voting. He said his group opposes the bill as written. Stroebel plans to amend the bill to add flexibility for small communities. Purging Voters Big Success Too: Defying human nature, the conservative activist Supreme Court allowed postcard address confirmations to stand. So people don't throw stuff like that away or say it's nobodies business where they live? The Supreme Court on Monday upheld Ohio’s aggressive efforts to purge its voting rolls, siding with Republicans in the latest partisan battle over how far states can go in imposing restrictions on voting. Justice Breyer wrote, In 2012 Ohio sent out 1.5 million notices, to roughly 20 percent of the state’s registered voters. But only 4 percent of Americans move outside their county each year, he wrote. Georgia Secretary of State Brian Kemp, the chief elections official in the state, is a pioneer of present-day voter suppression. Mr. Kemp has a record of making it harder for people to register to vote, and more difficult for those voters to remain on the rolls. Since 2012, his office has canceled more than 1.4 million voter registrations. In July 2017, over half a million people — 8 percent of the state’s registered voters — were purged in a single day. As of earlier this month, over 50,000 people’s registrations, filed before the deadline to vote in the coming midterm election, were listed as on hold. Seventy percent had been filed by black applicants. Since 2012, his office has canceled more than 1.4 million voter registrations. In July 2017, over half a million people — 8 percent of the state’s registered voters — were purged in a single day. As of earlier this month, over 50,000 people’s registrations, filed before the deadline to vote in the coming midterm election, were listed as on hold. Seventy percent had been filed by black applicants. Olivia Pearson, a grandmother and lifelong resident of Coffee County, Ga., found herself on trial this year oncharges of felony voter fraud. It began six years ago, on the first day of early voting in Georgia, when a black woman named Diewanna Robinson went to cast her ballot. She asked Ms. Pearson, more than 30 years her senior, for help. Ms. Robinson would later testify that Ms. Pearson informed her where the card went in the machine and told her to “just go through and make my own selections on who I wanted to vote for.” Ms. Pearson walked away before Ms. Robinson started voting. Almost four years later, Ms. Pearson received a letter from District Attorney George Barnhill’s office, informing her that she was facing felony charges for improperly assisting Ms. Robinson. because Ms. Robinson was not illiterate or disabled, she had not been entitled to even minimal verbal assistance. Over the next two years, Ms. Pearson navigated two trials, two defense counsels, three dropped charges and one hung jury. Finally, in late February, after a 20-minute jury deliberation, she was acquitted of all charges. Six years after her brief interaction with Ms. Robinson, she was finally free.